This is going to seem like a really obvious statement but do you know what students are the right fit for your college? Definitively knowing the answer to this deceptively complex question could be the answer to your enrollment woes. Going after the right type of student with the right strategy can mean a dramatic increase in enrollment and acceptance figures. It can also mean that your students are more likely to graduate with higher retention rates. The big question is how do you know what this ideal student is and how do you go about targeting them. Recently, we came across an interesting case-study from the ‘Up and Up Agency’; a higher education marketing agency that helps colleges & universities stand out above the noise. 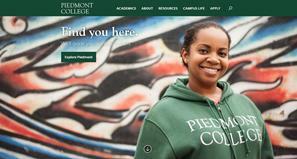 The agency had worked with Piedmont College, a dynamic small college located in the foothills of the north Georgia Mountains. The college has a total enrollment of approximately 2,200 students and recognized the need for a rebranding to increase enrollment. The Up and Up Agency worked with the college to uncover who their ideal students were, spending a couple of days on campus leading focus groups with students, alumni, faculty, staff and administration and found that Piedmont is a great fit for students who need extra attention in a location that didn’t come with many distractions. The students that would fit Piedmont best thrived in a learning environment that was personal and kept them accountable. The agency also surveyed prospective students, their parents and even high school guidance counsellor’s to gauge brand awareness, sentiment and why they would or would not consider Piedmont. The brand rollout consisted of a refreshed brand identity, new brand guidelines, an overhauled website, content strategy, social and email collateral and a brand awareness strategy that focused on prospective students and guidance counsellors at the right size schools in specific geographic locations. You can read the full case-study here and find out more about Piedmont College and the Up and Up Agency. Has your college researched the best type of student for your institution? Let us know your thoughts in the comments below.